Price Point Epic Baggy Shorts are high on value, low on price. Helenca liner with a Microsuede chamois, leg grippers, two side pockets, seamless gussett for added comfort, and a drawstring waist. The Epic Baggy shorts come in a variety of colors and sizes. What initially caught my attention was it s price. The Epic Shorts are only $29.98, that’s at least a 50% discount for other name brand shorts. 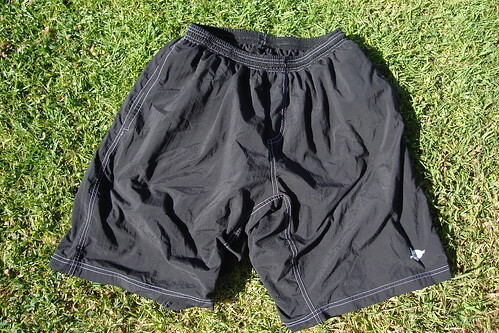 The material used to make the outer shorts are high in quality, very durable and breathable. I didn’t see any weaknesses in the quality and function of the shorts at all. The only draw back to them is my height. Being only 5’7″ (on a good day) the shorts seemed a bit too long. But remember, those aren’t the short’s fault, its my parents….they aren’t the tallest people on earth. Other than that, I saw no flaw in the stitching, fabric nor the chamois. The Price Point Epic Baggy shorts are a great deal for less than $30! I can’t find any other baggy shorts on line or in an LBS that sells baggies that affordable. I liked the flawless performance of the Epic’s and have even used them on two XC races and one charity ride. In fact, the Epics are the main shorts I use. I have another pair of baggy shorts from Performance that I don’t really care for anymore. Would I recommend it? Yes I would. These shorts are a great value. They won’t break the bank, not like the other name brands that sell for twice as much. The Epics are perfect for the guy that wants great biking shorts and that is on a strict budget. For more info on any Price Point products, CLICK HERE! I am in need of biking shorts. I’ve been off the bike for few months now and the bike seat is really digging in. I’ve been getting a lot of saddle sores from biking to work. The cheapest I’ve seen biking shorts at my bike shop is $40. Will these provide the same level of crotch padding as other shorts? Are there other products out there that may be better suited for reducing saddle sores? Jeff, Thanks for the question. Yes these shorts offer great padding and comfort that is comparable to higher priced shorts in the market. 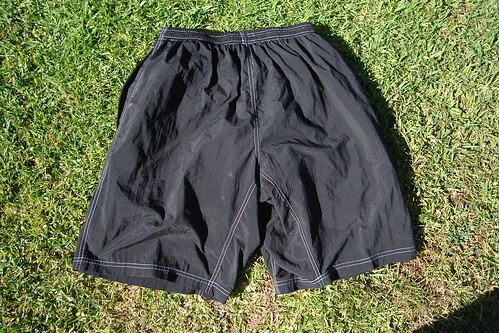 I’ve had a pair of a competitor’s shorts…and I have to say I like the Epics more. Seriously man, if you need shorts, you should really get these. They are affordable, strong, and they have never ripped or had the stitching fray at all. I consider them a high quality product. I’ll let you know what I think after I give ’em a try. These should be a big improvement on the generic exercise shorts that I have been using. The wife and I are signed up to do the Flat as a Pancake metric century on the first weekend of June and that should be a pretty good test.